I find this link between sound, the present, and the body richly explored by Tan Lin's digital poem, “Echo,” archived at UbuWeb. An echo reflects sound waves back to the listener, often in a diminished manner. Usually, a quiet or isolated space is required. We tend to also focus on the moment of delay between the first sound and its reflection. In Lin's piece, what appear to be nine equally sized circles organized in three rows on top of each other revise themselves to be read as a large-font “O” when the Flash program kicks in. 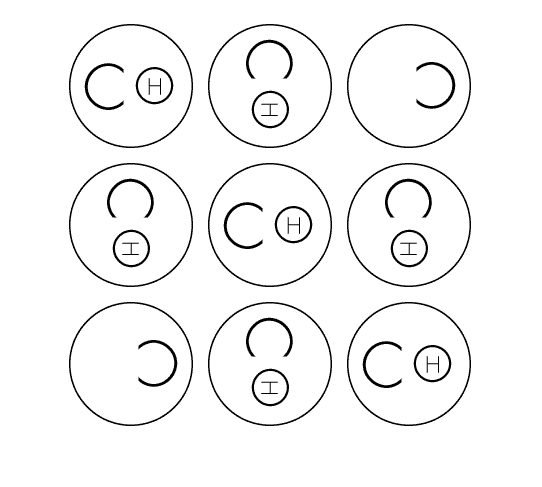 The large Os visually resonate (and, by virtue of that word’s meaning, imply a sonic reverberation) the moment the letters “E,” “C,” “H” and “O” blink into appearance within the confines of each circle. The symmetries between the clean lines of the letters “E” and “H” balance the neatly curved “O” and “C” when they appear. An echo tracks a sound's decay, heightening our attention of the passing moment, Yet in Lin's piece, each large circle has its own rate at which the letters appear inside, which suggests a metaphorically visual “cacophony” of sounds and reverberations for the reader/viewer. In Lin's piece, my encounter with the present moment is transformed. Rather than experiencing an escaping or elapsing "present," I am confronted with its continual emergence. His piece invites me to imagine the present as a constantly refreshing, re-populating phenomenon. By transforming an echo into a visual experience, his piece also dislocates me physically. By "hearing" wth my eyes, distance is collapsed. My body's imagination invokes echoes in cavernous, absented spaces. The visuality of Lin's piece disrupts this; it were as though his "echo" produces an experience of the present moment that is two dimensional and fourth dimensional, forgoing the third.